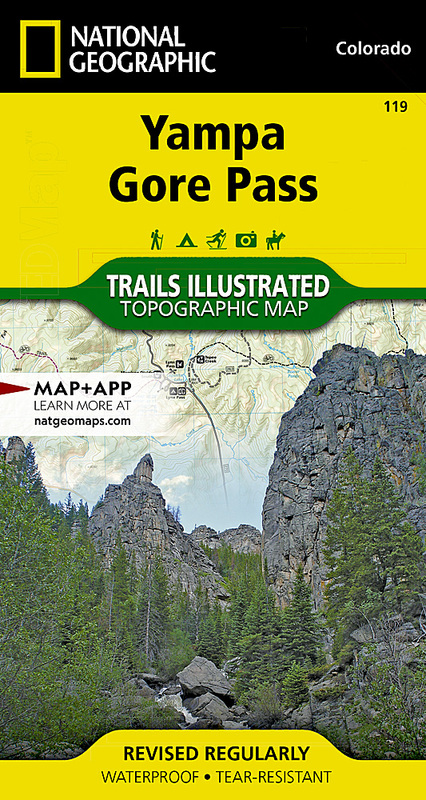 Outdoor enthusiasts seeking to enjoy the year-round recreational opportunities in and around southern Routt National Forest will marvel at National Geographic's Trails Illustrated map of Yampa and Gore Pass. Created in cooperation with the U.S. Forest Service, Bureau of Land Management and others, this expertly researched map delivers unparalleled detail of the area. Coverage includes Arapaho National Forest, Sarvis Creek Wilderness, Five Pine Mesa, Egeria Park, King Mountain, Gore Range and Red Dirt Reservoir. Let mapped trails guide you off the beaten path and back on again. Trails and Forest Service roads are marked for hiking, cross-country ski, snowmobiles or other motorized use. To aid in your navigation, the map also includes contour lines, elevations, labeled peaks, summits and passes, water features, areas of wooded cover, selected waypoints and clear color-coded boundaries between different land management agencies. Some of the other recreation features pinpointed are areas for camping, picnicking, climbing, skiing and wildlife viewing. Additionally, wilderness regulations, survival tips, Leave No Trace guidelines and essential contact information is provided. Other features found on this map include: Arapaho National Forest, Gore Mountain, Routt National Forest, Sarvis Creek Wilderness.